We can’t understate the importance of social media on the enterprise. Hey – we bet our whole business model on it! And that’s why we hired one of the best thinkers in the social sphere to help us understand how social will impact business processes and how enterprises will operate in this new social world we live in. So we coaxed Jonathan Yarmis from his Dreamforce-induced hangover, where he was living it up with 90,000 other technology geeks, to tell HfS why social actually matters…. Phil Fersht (HfS): Jonathan – why the hype over social? should enterprises care? what is hype versus reality? is this just the tech industry jumping in the next soundbite, or is there something real here? Jonathan Yarmis (HfS): The hype over social is very simple and I can capture it in one statistic: 950 million people are on Facebook. Social is transforming the way we communicate with each other, and the way we discover and share things. Enterprises should care at so many levels. First, we’re in an era when consumer technologies move quickly into the enterprise market so consumer social trends presage changes that are coming in to the environment. Second, you should care if you want to reach and communicate effectively with your employees, partners and consumers. Your customers are already sharing insights and information via social channels. All organizations will have change brought on them by these stakeholders. Savvy enterprises will capitalize on these changes to build better connections with their communities. We just came back from Salesforce’s Dreamforce user conference, where the whole theme of the 90,000 person event was building the social enterprise. Microsoft paid over $1 billion to buy Yammer. Enterprise vendors are making real and substantial investments to build out their social portfolios. Oh yes, there’s something real and building here, and the vendors continue to double down on that investment and belief. Phil: Is “social” just being over-hyped like cloud was, or is there some real substance here? Jonathan: Of course social is being over-hyped. That’s the nature of the technology business. But let’s understand the nature of that overhype. It has been recent history that we overhype in the short-term but actually under-hype in the medium term. Think back to the days of Pets.com and Webvan. Perhaps we were a little ahead of ourselves in the short-term. But fast forward 10 years. If I had told you a decade ago, that if the Internet shut down, we’d just go home because we can’t get our work done; if I told you a decade ago that governments would be toppled in large part because of social media; you would have laughed. Yet here we are a decade later and those are our realities. Yes, there’s substantial substance here but even more significantly, we’re still in the very early stages of realizing the business value to be derived and the significant opportunities that exist, not to mention the changes that social will bring about to the way we work. Phil: what’s next for social beyond twitter and Facebook? Are we already at maturity stage for social, or is there still a long way to go? Jonathan: We’ve just scratched the surface of the changes that are going to be wrought by social. Phase one has largely been a consumer phenomenon and our functionality has been limited, largely constrained to the creation of what we’ve taken to calling activity streams (your Twitter or Facebook news feeds). In the second phase, we’re going to start mining those activity streams for more business insights, from sales indications to customer support requirements and more. And amplified as these streams are by the deployment of mobile technologies and the proliferation of sensors and other forms of intelligent devices, social platforms will become more intelligent, more real-time and more active. There’s a recurring pattern with new technologies. First, we enhance existing processes through the incorporation of the new technology, in this case social. Only later on do we ask “what can we do that we haven’t been able to do before?” We’re about to embark on that exciting second stage with social, which is where we realize the greatest value of a new platform, albeit with the greatest change and threat. Phil: How is this going to impact the global services industry? Jonathan: Social may well prove to be one of the most exciting technological changes in history in terms of how it impacts the global services industry. For service providers, there are large opportunities in the short-term. Customers are dealing with an unfamiliar challenge and so many opportunities that they’re often paralyzed. Call it the tyranny of opportunity. Into that breach, service providers can help customers make meaningful advances in terms of helping clients to build a “social business.” But that’s not the big opportunity. More profoundly, rearchitecting businesses around social processes creates opportunities for service providers to facilitate significant process improvement. Service providers can incorporate themselves deeply into a client’s business process, sharing knowledge, driving insights through analytics and otherwise becoming integral parts of their clients’ business processes. Some service providers will be challenged by the emergence of social businesses, fearing loss of account control. Far-sighted service providers will realize social platforms actually enable deeper connections with their clients, enabling the providers to better add value to all areas of their clients’ processes. This is one of those lead, follow or get out of the way moments for service providers, except it’s more like lead or wither away into irrelevance. Your clients are changing their business processes; you’ll either facilitate those changes or fall victim to them. 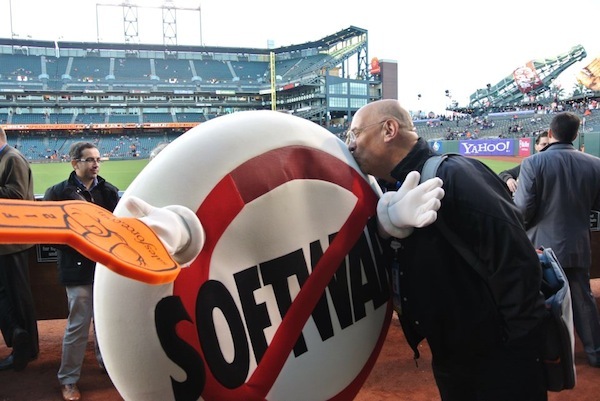 Phil: Jonathan – thanks for the feedback from Dreamforce! Now for your next gig at the HfS 50! Jonathan Yarmis is Research Vice President, Social Business Services Research and Disruptive Technologies at HfS Research, You can view his bio here and email him here.